You’re not going to hear any snarky comments from me on this even though the photo is obviously begging for one. There’s no context here so it’s a bit unfair to for me to shake my fist and yell for these kids to put down their telephoney-machines and get off my lawn. 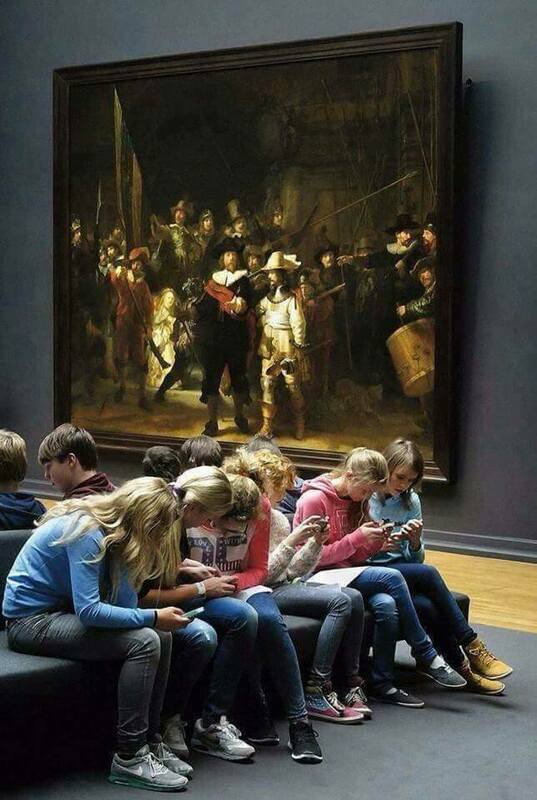 Maybe they were asked to do some quick research by their teacher about Rembrandt and his masterpiece, The Night Watch, the painting shown in this photo from the Rijksmuseum in Amsterdam. I don’t really know. But it does provide a stark example of how we often forget to experience the here and now, how we fail to calmly sit back and just take in our surroundings. Often, our present moment and place holds something remarkable and real. I can’t say that we are better or worse off for being so tethered to technology. A case can definitely be made for either. But we should not lose our ability to look and listen, to engage and absorb the world directly around us. Without that ability there will be no more epic paintings made for future generations to ignore. This article approaches things from a slightly different perspective, but I think it’s relevant, and interesting, and important. Thanks for the article, Linda. Interesting read. I often wonder why there is such a need for the seemingly endless stream of photos that are taken. Maybe it is simply the act of taking it rather than the actual image. Hmm…. You’re right in surmising that someone may have instructed them to research the painting, hence their rapt attention to their devices. And that raises other questions … meaning no disrespect to docents and other educators, if they were looking at the painting while being told about it by some authority we would incline to be more approving, but perhaps they’d still be missing out on the painting itself. Our society is so intent upon getting the “right” answer to things. But to simply look at Rembrandt’s painting and first see simply what it looks like, and to notice what its effect is on oneself, what feelings it evokes, to notice its beauty and so on, to wonder to oneself what it might be about … before being “told” … I think that’s the engagement with art that people really miss out on! It’s nice to experience painting as we experience life, and life has no instructions and no docents. I’ve got nothing against education! But sometimes we need to rely on our own sensibilities. It may be that we, especially those of us who grew up amidst all this technology, need instruction on the art of looking and listening, on how to absorb the moment, or on amusing ourselves without a machine. Very true! And art of living in the moment. People are so tethered to their technology that they walk into buildings and walk off curbs and cliffs while distracted by the tiny screen messages they are looking at in their hand. Not sure if this will change. Maybe next step is having GPS built into their physical systems for their survival. Not sure how that would work, though. ~Margaret. Sci-fi writers and futurists have been predicting the merging of human and machine at some point. Perhaps this is the starting point.